There is always a line. You can’t step out of the line for one split second or you have to go to the end of the line. It’s like waiting at the water fountain in second grade. And one out of the four will need to go the bathroom. And one of the four will manage to hurt themselves on nothing right there in the line. And one of the children will be very loud about something and it echoes. And someone will take a very very long time to mail and very very tiny packag. For the last two years, Amelia has made cookies to sell to make money to send a family animals that they can raise to support their own families. The Samaritan's Purse magazines come and she pours through them trying to decide what she will send. She patiently waits to see how much money she is able to raise and then narrows it down and decides. This year, she decided to make earrings. They are beautiful! She taught George Wilder how to make them and he is right there with her making them. She took some pictures of her work, which I am posting. They've made a few more and will keep making them. If you would like to order a pair, please let me know and I will happily take some more pictures or I can get an order from you. I'll post more soon. Here is a start. 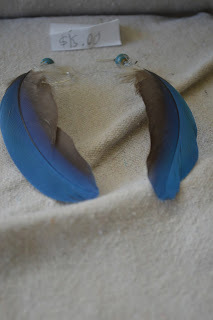 In case you aren't crazy about feathers dangling from your ears, she has also made some beautiful ones with just beads. Little boys for making alphabet pretzels and chatting with about life. Fireman costumes for dreaming. Costumes always. Books for playing games. Throw to the ground. Brother hands it back. Throw to the ground. Brother returns. Herbs and flowers for making perfume and paint. If you look closely their is a smudge of yellow on her forehead. And beans that are artwork in a bowl. An army of children for play and fun and learning and passion and love and noise and life. I handed George his steaming coffee, swept Hannah onto my hip, grabbed my cup of Joe and headed out the door behind George. We were heading out for a sweet Sunday morning stroll around the farm. The gardens are bursting with greens and squash and beans and lettuce, the sweet baby pigs are quite entertaining, and it’s October in Florida in the morning – cool, bright, and free from suffocating humidity. It is sweet to be together and take in this place we love.